Home / Columnists/ Possibility of a common democratic woman candidate ? Possibility of a common democratic woman candidate ? The best possible scenario for the future of democracy in Sri Lanka would be to field a ‘common democratic candidate’ for the next presidential elections against a Rajapaksa candidate. Given both the omissions and commissions of the so-called Yahapalana government, there would be no possibility at all in preventing the Sri Lanka Podujana Peramuna (SLPP) capturing power at the next parliamentary elections. If the SLPP or Rajapaksas capture power in both institutions, that would be a considerable setback for democracy, if not a disaster. A balance between the two institutions, the Presidency and Parliament, might be the best possible democratic outcome one can think of, given the present circumstances. Possibilities for MS and/or RW? There is no possibility of either Ranil Wickremesinghe (UNP) or Maithripala Sirisena (SLFP) winning the next presidential election, even if they come together to agree upon a ‘common candidate’ between them. The present trend is for them to contest against each other, given the soured relations within the Government, between them and between their parties. This would be a disaster for them and the country. There has been a steady decline of the UNP’s primary vote as shown by many observers for the last decade or so. The SLFP’s primary vote is completely split as revealed by the local government elections in February 2018, the overwhelming majority going under the SLPP. There is a possibility that if the UNP strongly endorses MS again as the common candidate, like in January 2015, he would probably obtain more votes than RW could get as a common candidate even with the formal support of the SLFP. The SLFP in this respect is completely unreliable given its internal fissures and past record. Therefore, more prospects are for MS as a Yahapalana common candidate than for RW. However, winning the presidential election is quite unlikely given the erosion of democratic base and space of the Government. The minority votes that MS could get in January 2015 are largely eroded both among the Tamils and the Muslims for understandable reasons. There is a possibility that if the UNP selects a different candidate to RW, for example Sajith Premadasa, he might be able to increase the voter base in the Sinhala dominant areas, but not necessarily in other areas. The erosion of the UNP primary vote is largely due to the unreliable personality of RW, in addition to economic policies and follies. For a new leader to resurrect the voter base might take a long time. There is no such apparent need for a leadership change in the SLFP. The party is in total chaos due to different reasons. In both parties, a leadership change is difficult given the lack of internal party democracy in Sri Lanka. Under the given circumstances, neither MS nor RW would appear as a ‘democratic common candidate’. Although their recent past record is not bad as Rajapaksa’s, the gap between what they promised and what they have delivered is considerable. There is no new constitution, but only a distorted 19th Amendment. Yahapalana decision making has been abysmally slow in all fronts. Although many in the last government have been accused of past corruption or criminal involvement, there is no significant prosecution so far. Corruption is still going on unabated and a recently caught culprit for bribery has been President’s chief of staff. RW is directly implicated in the bond scam. The national debt has increased and not decreased. The people in the North apparently don’t see much difference between the last government and the present, according to well reliable sources. The Muslims are outraged, particularly of the way the recent Kandy attacks on Muslims were handled. Democracy cannot be separated from economic development. People in the South are particularly outraged for poor economic performance of the present Government. There is a considerable disparity between the declared visions (Vision 2015) and actual performance. Poor economic performance invites authoritarian rule. When we think about the general political situation, there is widespread disillusionment about political leaders, and political parties. This is what I have realised during my recent visit to the country in July and August. Many unknown people, to whom I have managed to talk to, expressed their disillusionment in anger or sarcasm. As reported recently, a large number of eligible voters particularly in the Colombo district have not registered for voting given this disillusionment. It might be still possible for the Opposition or the Government to mobilise people to march to Colombo against or in support of the Government. Those are their closest supporters and followers. Those demonstrations are however not clear indications of how people perceive or feel about politics, and about broken promises, by almost everyone again and again. There is a clear breakdown of representative democracy. The elected representatives do not any longer represent the people’s will or aspirations. They largely represent their own interests, or mere party interests, or the interests of their funders. This was clear during the evidence revealed at the bond scam investigations, and in many other revelations about election funding by various sources, international and national, for all main parties and party candidates. The so-called people’s representatives at all levels, who are mainly looking after their own perks and befits, have completely betrayed the ordinary people. Many MPs do not even attend important parliamentary sessions/debates and many sessions have recently been postponed for the lack of a quorum. The present crisis in the representative system is not merely because of the erroneous electoral system, but because of the total degeneration of the political culture and democratic ethos. It is obviously not possible to change the situation overnight or within a short span of time, although there is considerable will among certain sections of the society, and particularly among the young, for a positive political change. There might be some sections within the existing political parties or even among the existing MPs who would be willing to support such a change. There are various people’s organisations in the country, not limited to the discredited formal NGOs, who could spearhead such a change. For example, the Sarvodaya movement has launched its ‘Deshodaya’ (national awakening) program, celebrating its 60th anniversary this year, particularly for this purpose. The whole movement might take certain stages, and would require practical measures, and most important at this stage might be to begin a discussion on those lines. The spontaneous drive in search of alternatives, and more specifically alternative candidates for Presidency, was reflected in the recent proposals to field Kumar Sangakkara by some, and Nagananda Kodituwakku by some others. Both have denied the possibility of coming forward, for obviously different reasons. Among them at least Kodituwakku has expressed his continued commitment to be active and fight for change particularly in the constitutional sphere, anti-corruption and rule of law. 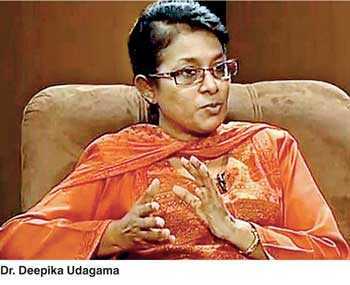 It is in this context that I wish to raise the question: ‘Why not Dr. Deepika Udagama as a common, democratic and a woman candidate for the presidential election? This is proposed without her consent or knowledge by purpose, for the sake of public discussion first. Therefore, her willingness or capacity is yet unknown. If she is not willing, a similar person should be proposed or come forward, possibly a woman with independent and strong credentials. Udagama is not an unknown person in public life. Why not a woman for a change? She has no political party or any other partisan affiliation. However, she is completely familiar and knowledgeable about politics. Having been mainly a university academic in the field of law, she is one who has kept her integrity intact. She is familiar with country’s law, constitutional law, international law, and most importantly human rights law and issues. She is the present Chairperson of the National Human Rights Commission performing an excellent service. She will be completely reasonable to all persons, communities and all religious groups. This is not her full profile but some glimpses. Her name is proposed in a particular context. The country might not be in a position to avoid a political backlash to its democracy, for the omissions and commissions that the present Government has committed, unfortunately in the name of democracy and good governance. There is hardly much possibility of avoiding the SLPP or Rajapaksas coming to power as the government. Hopefully, they should learn the lessons of the past and behave at least more democratically. However, there is much possibility of avoiding the SLPP or Rajapaksas taking over the Presidency. This cannot be done by the UNP or the formal SLFP contesting separately or jointly, but their active support for a common, independent and a democratic candidate is necessary for a possible win. If they are committed to democracy, they should reform their political parties and contest with new candidates at the next parliamentary elections, at least to constitute a strong opposition. A democratic President and a strong opposition in Parliament with new and reformed UNP and SLFP candidates might be the best that the country can think of at the moment for the country’s democratic future.